Editor's note: Best known as the creator of Instapaper and formerly the lead developer for Tumblr, Marco Arment [ @marcoarment, marco.org ] is far from convinced that Android will become developers' mobile platform of choice, as Google Executive Chairman Eric Schmidt is predicting. The quotes excerpted below are from this CNET article about Schmidt's speech at Le Web. Post syndicated with permission. Read the original here and see his exchange with developer Gina Trapani here. "Ultimately, application vendors are driven by volume, and volume is favored by the open approach Google is taking. There are so many manufacturers working to deliver Android phones globally," Schmidt said. "Whether you like Android or not, you will support that platform, and maybe you’ll even deliver it first." Is he implying that Android is widely disliked, and it doesn’t matter to him? Why does Google let Eric Schmidt speak publicly? Has it ever turned out well? One Android-toting audience member said he was frustrated to see iOS apps beating Android versions to market. But in part because of Ice Cream Sandwich, “my prediction is that six months from now you’ll say the opposite,” Schmidt said. Developers only need to ask themselves a simple question when considering whether to put much faith into Schmidt’s statements: What will be different in 6 months? 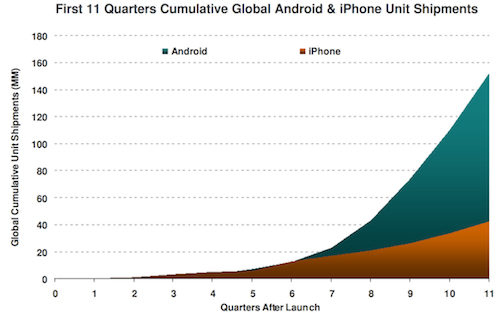 Android devices have been selling in large quantities for a long time. That’s not new. Yet today, compared to iOS, Android is much less profitable for developers (especially for paid apps), its users are less influential for expanding new services, and its app development is much more painful and expensive. And in the rapidly growing and increasingly influential tablet market, Android has an extremely low marketshare. Will Google’s release of Android 4.0 result in a significant improvement to any of these issues?